Manage your photos fast and easily. Over time you get great quantities of digital camera photos on your computer. The clarity is lost, duplicate folders and duplicate photos, pictures are not rotated correctly, folder names do not match, no reasonable folder structure is present. You have to search for every single photo. The solution for this is sortpix xl. 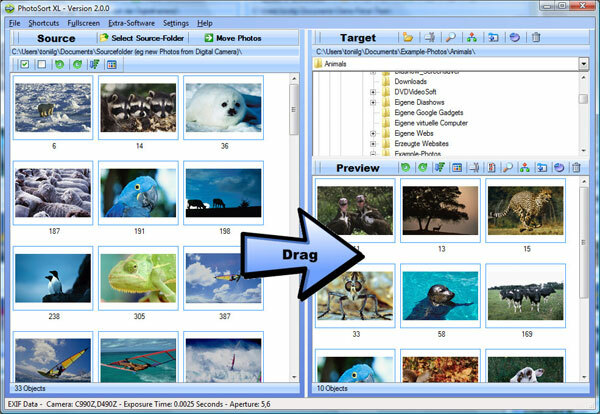 First create folder structures and then drag photos with the mouse to sort them. In little time you can bring back order to your hard disk. Also included: the duplicate photo finder. The photo manager software offers many useful features such as photo sorting, photo management, and duplicate photo cleaner and a comfortable picture viewer. The photo management program has a quick window change and a linked display of 4 levels for fast navigation. This product includes extensive filter and sorting functions, various previews, display of exif data like camera type, shoot date, exposure time and aperture etc. The program also allows insertion of date formats when creating new folders, extensive search functions over the entire hard disk with filters by date, sorting by file types, etc. , sorting of photos by shooting date, name or size, and setting the order of images in a folder permanently. Function to create slide show with music, a multiple renaming tool for photos. SortPix XL 2019 is an utility that works under windows xp, windows 7. It supports both 32-bit & 64-bit windows editions, therefore it could run faster on 64-bit computers. Estimated download time for SortPix XL 2019 on a common adsl connection is less than a minute. Version 19.0.3 is brand new and was released eleven days ago by IN MEDIAKG TI. Click the green download button to download it now.